Provide comfort for the family of Rosemary McAulay with a meaningful gesture of sympathy. Passed away at age 92 with loving family by her side while at the Algoma Manor. Predeceased by her loving husband Duncan McAulay (November 27, 2005) and her son Philip MCAulay (February 27, 2006). Mother of Beverley Warner (Dawson), Roger McAulay (Gail) and Jane Foster (Bill). Mother in law to Helen. Grand, great grand and great great grandmother of many. The family would like to thank the staff at the Algoma Manor. If desired, the family appreciates donations to Light Haven Christian Home or to the Algoma Manor Foundation. To plant a memorial tree in honor of Rosemary McAulay (Burrows), please visit our Heartfelt Sympathies Store. So many good memories of visiting Rosemary at the farm also good time with the Thessalon Youth group there also. 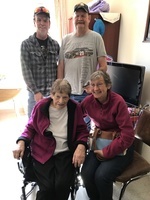 I enjoyed visiting your mom at Light Haven Home when we were there to see my mom . Our condolences to the family on the loss of such a loving gentle soul.